Leslie Madison began writing professionally over five years ago, specializing in beauty, health, nutrition and skin care topics. She regularly writes beauty, health and lifestyle stories for both print and online magazines including "Long Island Bride and Groom" and Teen Scene. Madison has a Bachelor of Arts in communication from Rutgers University. Professional shampoos and conditioners are sold in salons and spas. The most important thing to consider when selecting professional shampoo and conditioner is hair type, whether it is dry or damaged, fine or thinning or color-treated. Dry and damaged hair needs shampoos and conditioners formulated with humectants to help draw and seal in moisture. Panthenol is a beneficial ingredient for fine hair because it helps build body. Those with color-treated hair should use shampoos and conditioners that are sulfate-free, which helps keep color looking vibrant longer. Professional shampoos and conditioners tend to be much more expensive than the formulas you can buy in the drugstore. One reason for the cost is the use of better ingredients in higher concentrations. Professional shampoos and conditioners contain high-quality protein and moisturizing ingredients that can penetrate deeper into the hair shaft to seal in moisture. 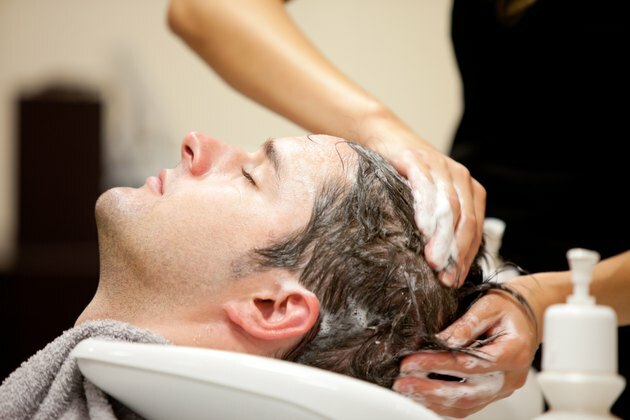 Authorized salon locations usually sell professional shampoos and conditioners. Sometimes, drugstores or grocery stores carry professional products. This is referred to as diversion, which happens when a collector solicits a salon to purchase products on its behalf, but then sells them to a third party such as a drugstore. Professional shampoo and conditioner brands will only guarantee the quality of their products when purchased through an authorized salon location. The price of professional shampoos and conditioners vary from brand to brand, but a typical range is $12 to $30 and up. Pureology, for example, is on the high end in terms of price with a 10.1 ounce of shampoo retailing for $30. However, the formula is concentrated so you can use less than a shampoo from the drugstore. Certain professional salon hair care brands are known for being beneficial for certain hair types. Kerastase, for example, has a variety of shampoos and conditioners that contain proteins and lipids to help moisturize and repair dry and damaged hair. Nioxin is a line of shampoo, conditioner and styling products developed specifically for fine and thin or thinning hair. The brand promotes healthy scalp and hair growth. Pureology is a popular line for color-treated hair because it doesn't contain any sulfates or harsh salts that can strip hair color. It uses vegan ingredients to gently cleanse and condition. Hair Styles: Are Salon Hair Products Really Better? What Kind of Olive Oil Will Make Hair Shiny?